Micro SD card (Secure Digital Memory Card) is one of the most widely used data storage devices. However, there are tens of thousands of users all around the world that face the issue of data loss on Micro SD card and other devices. therefore, you need a suitable tool to help you. Bitwar Data Recovery is a wise choice for you to easily and quickly get lost data back from memory card, Micro SD card or CF card etc. With friendly user experience and wizard operation, you can recover the data with only three steps and easily find the lost data even if you are not familiar with computer operations. ● Recover files lost due wrong deletion, power failure, virus infection. ● Restore formatted Micro SD files due to mistaken formatting. 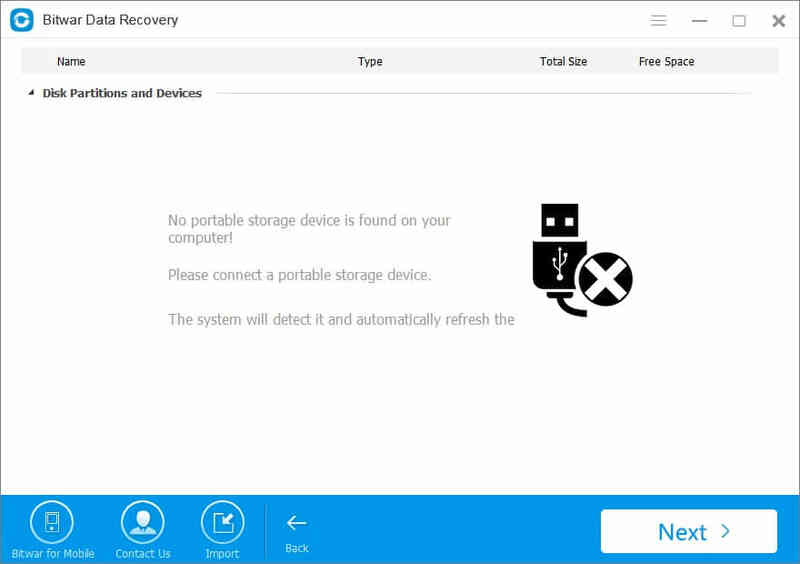 ● Recover files from formatted damaged, unreadable or defective Micro SD cards. 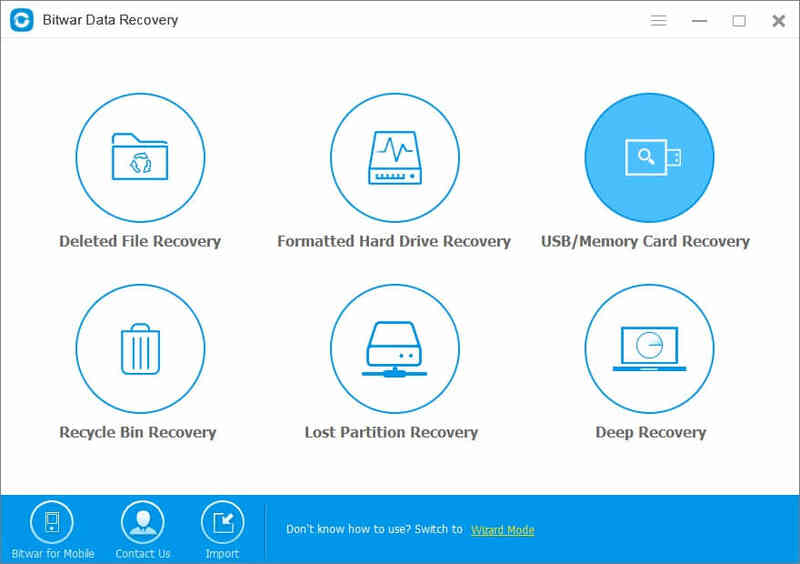 ● Support deep recovery modes to ensure 100% success of data recovery. ● Preview the lost data before recovering them. Supported OS: Windows 10/8.1/8/7/Vista/XP, Mac OS 10.11 and higher. ● Documents: DOC/DOCX, XLS/XLSX, PPT/PPTX, PDF, CWK, HTML/HTM, INDD, EPS, etc. ● Image:JPG, TIFF/TIF, PNG, BMP, GIF, PMicro SD, CRW, CR2, NEF, ORF, RAF, SR2, MRW, DCR , WMF, DNG, ERF, RAW, etc. ● Video:AVI, MOV, MP4, M4V, 3GP, 3G2, WMV, ASF, FLV, SWF, MPG, RM/RMVB, etc. ● Audio:AIF/AIFF, M4A, MP3, WAV, WMA, MID/MIDI, OGG, AAC, etc. ● Others:SIT, and other useful data. when your data in Micro SD Card had accidentally deleted or formatted, it’s best to stop using your Micro SD Card, and use Bitwar Data Recovery to recover it as soon as possible.After downloading Bitwar Data Recovery, install and launch it on your computer. Then connect your Micro SD card to your computer with a card reader. Step 1：launch Bitwar Data Recovery, Select recovery Type “USB/Memory Card Recovery” when you want to recover lost data from Micro SD Card. Step 2：Select Micro SD card Drive on this step and click on the button “next”. The Bitwar Data Recovery supports all file types: pictures, videos, audio, emails, documents and others. Select the type of data you want to restore then click "Next" . Bitwar Data Recovery will start scan quickly. you will see all missing files that match the selection will be listed. After a scan, choose the data you want and you can make a selective recovery with Preview before recovery. Choose the data you want to recover after previewed. Click "Recover" to get them back . Here you should save all the recovered files on computer disk to avoid data overwriting.DO NOT save the files into your Micro SD Card where you lost data. Following this action, the deleted files on Micro SD Card has been recovered. After recovering the data, please remember to pay attention to the backup. Previous：How to recover deleted files from memory card with Bitwar data recovery software? Summary：The memory card is a popular data storage device widely used in digital cameras, handheld and mobile computers, telephones, music players etc. It may be a heartbreaking thing if data in memory card have been lost. How to get back it? Summary：SD memory card is widely used on various portable devices, such as digital camera, mobile phone and multimedia player. Although it brings users great convenience, you may always find files missing without any idea how to get back them!